Ever heard of a driver performing a gymkhana while climbing the world-renowned Pikes Peak? Seems unusual and outrageous, but there is a driver daring enough to take on this challenge. Professional rally driver, Ken Block, is more than skilled to pilot an equally outrageous car to perform a “Climbkhana” (climbing + gymkhana) at the Pikes Peak, the high point of the El Paso county in Colorado, United States. A gymkhana performance is a difficult thing to accomplish, and so is climbing a 14,000-feet mountain. Block managed to accomplish both in his Pikes Peak Climbkhana performance, making it seem that his methanol-fueled highly modified car was dancing as it traveled from the starting point to the finish line at the peak. To set things straight, Block’s Climbkhana wasn’t a shot at being the fastest to complete the Pikes Peak. That record was set in 2013 by Sebastien Loeb in the driver’s seat of a Peugeot 208 T16 Pikes Peak. He completed the 12.42 miles of the climb course in just eight minutes and 13.878 seconds. That wasn’t an easy feat, considering that climbing from 9,390 ft. (2,862 meters) to 14,110 ft. (4,300 meters) -- both above sea level – affects the performance of a typical engine due to atmospheric density or air density. Thinner air means less compression for a typical engine as less oxygen and other matter is drawn into the cylinders. As a general rule of thumb, the engine loses between three to four percent of its power (output and torque) for every 1,000 feet above sea level. This means that at Pikes Peak, a typical engine only retains 71 percent of the supposed power level at the starting line to 59 percent at the finish line. However, solutions like turbochargers could mitigate this effect, and Block’s driving machine has, not just one, but two of them. Introducing the Hoonicorn V2, the much improved version of the 845-hp Hoonicorn unveiled at the 2014 SEMA show. Derived from the 1965 Ford Mustang, the Hoonicorn was powered by a 410 cubic-inch 6.75-liter Roush Yates Ford V8 engine that delivers 845 hp of max output and 720 lb.-ft. of peak torque as mated to a six-speed Sadev SC90-24 all-wheel-drive transmission with a hydraulic handbrake system. Eventually, Block decided to squeeze more power out of the engine by employing two turbochargers and cranking up the boost to 21 psi. The engine’s hardware was also modified to allow it to burn methanol. The result is around 1,400 hp worth of devastation. The bonnet of the evolved Hoonicorn features colors of the American flag, although the popped out engine and turbochargers are more recognizable than the livery. 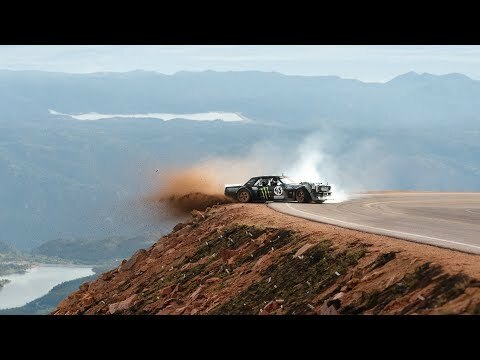 The Hoonicorn V2 rides in bespoke Toyo compound tires -- Toyo Proxes R888R tires in particular – to deliver the grip and stability that Block needed while dancing his way up the Pikes Peak. Toyo Tires® presents Climbkhana the next generation of Ken Block’s wildly successful and award-winning Gymkhana series of viral videos. The all new concept is a hybrid of the driving showcased in the previous films, blended with a rally-road style attack on unique roads around the world. To kick off this new series, Ken Block chose what is arguably one of the most famous roads out there: The Pikes Peak Highway outside Colorado Springs, CO. The Pikes Peak International Hill Climb is the most well-known hill climb in the world, billed as America’s second oldest, continually running race (the Indianapolis 500 is first), it’s also one of the first places Block ever raced in his career. “When I was young, I caught the Pikes Peak International Hill Climb on TV once or twice,” said Block. “Even as a kid I remember dreaming about racing there some day because it looked so epic. Eventually I did, back in 2005, but it was in a Group N rally car which didn’t have much power up in that high and thin air! It was an underwhelming experience because of the horsepower issue, but I loved the road and mountain - and I had always wanted to go back and do it right. So, to drive it like I get to drive in my Gymkhana videos - and do it in the Hoonicorn with 1,400 horsepower - well, that truly is a dream come true!" For Block, filming Climbkhana at Pikes Peak was a unique opportunity. While the road closes once a year for the Hill Climb, no one has ever been given the access to turn the landmark location into a playground. For production duties, Block once again brought his long-time friend and business partner at Hoonigan, Brian Scotto, to direct, but they also added a new face to the Hoonigan Media Machine formula: Eight-time Pikes Peak International Hill Climb Champion and Radical Media Director Jeff Zwart. To tackle the extreme elevation gains experienced along the way up Pikes Peak, Block knew that he needed more horsepower for his 1965 Ford Mustang Hoonicorn RTR. So, Hoonicorn V2 was born. A 1,400 horsepower, twin-turbo, methanol-fueled machine that lights up its sticky Toyo® Proxes® R888R™ tires in every corner and properly updates the infamous build made famous in Gymkhana SEVEN, Wild in the Streets Los Angeles. Unfortunately, extreme engine builds and altitudes can prove challenging. Block and his crew experienced multiple production setbacks, having to go to the mountain on three separate occasions over 12 months due to both weather and development issues to be able to finish the film. “This car is insane,” said Block. “I feel it genuinely wants to kill me! Before we added the twin turbos, it was the most fun car I’ve ever driven. Now it’s still quite fun to drive, but it melts tires ridiculously quick. To have this thing be such a beast and then take it to this very dangerous mountain, well, I thought I’d maybe finally taken on a project that might be too much for me to handle. This is the most powerful AWD-type car in the world to be driven this way, so I’m genuinely glad I didn’t die making this video!" Toyo Proxes R888R tires deliver the enhanced grip and stability Block needs when maneuvering the 1,400-horsepower Hoonicorn V2 around the famous curves of Pikes Peak. Learn more about the Proxes R888R DOT competition tire and find a dealer at toyotires.com/tires/. The film was produced by Hoonigan Media Machine and premiered last night at The Petersen Museum in Los Angeles. It is presented by Toyo Tires, Ford and Pennzoil. To watch it now, click the link below.